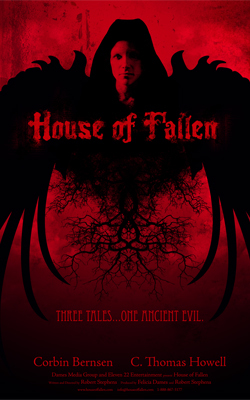 House of Fallen is a gothic thriller that combines the hunt for prophetic truth with mythical horror in three intertwining tales. Inspired by the Book of Enoch, House of Fallen invites you down a worm hole of ancient mysteries, surprising twists, and violent clashes as old as evil itself. Thomas wanted to get the hell out of the house. But how could he after what he had just heard? Thomas had come to visit Brian at the request of his best friend, Dr. Mara Park. It was not everyday that a psychiatrist of Mara’s reputation came to believe her patient was possessed. But how else could she explain Brian’s ability to read her mind? She had come to Thomas because he was an ex-priest, and she thought he would certainly know more about the demonically possessed than she did. Now Thomas sat face to face with Mara’s dangerous patient, and he was witnessing first-hand the terrifying experience of having someone reach deep into your own mind and see your darkest secrets that you prayed would never see the light of day. Brooks thought he had seen it all. As a member of a mysterious group known as The Twelve, he knew the world was far more complex than it appeared to be. After all, he was a soldier on the front lines of the ongoing war between Heaven and Hell. But Rowland promised to turn his reality upside down. Rowland takes Brooks to the Library of The Twelve, a vast archive that holds ancient scrolls that detail The Twelve’s battles with the fallen angels who wander the Earth. As Rowland reveals many of Hell’s secrets to him, Brooks soon realizes that no one, not even himself, is exactly who they appear to be. There is no such thing as the perfect crime, Shawn thought. Her boyfriend Tim DeHart lay dead in the abandoned mansion, a vicious gunshot wound to the stomach. Shawn walked out of the room and found the five surviving members of the gang staring at her. Some were angry. Some frightened. None knew what to do. She looked over to the large duffel bag sitting on the dusty table in the corner. Its contents represented a new life for her and the others. But DeHart’s younger brother Ben makes a gruesome discovery. In an upstairs bedroom, he finds a corpse, and judging by its state, it’s been there a long time. Then DeHart’s body disappears, along with their stolen money. Soon, demonic voices can be heard throughout the house, and when DeHart returns from the dead, the others realize that supernatural forces have taken control of their fates.